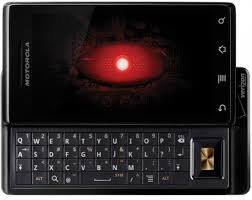 I recently purchased a Motorola Droid smartphone. I was looking forward to the Android operating system that it comes with and am very impressed with the amount of progress that has been made in the modding community. There are tons of alternative firmwares available across the web that include tons of different enhanced features, including overclocking! I’m currently running my Droid at 1Ghz (stock is 550Mhz)! My only complaints about the device is the battery cover is not completely flush on the back (one side is raised just slightly). I purchased a rubber gel case that should mask this issue, but Motorola is also giving away free replacement battery covers to anyone who requests one. Mine is in the mail. My other issue is with the hardware keyboard, which seems a bit shallow (I’m coming from a Blackberry Tour 9630). The touchscreen takes a bit getting used to for typing (once again, since I’m coming from a Blackberry), but after a few days I’m fairly used to it. On my phone I’m running Pete’s Bugless Beast v1.1 firmware (which was released today, and can be found at alldroid.org). I had issues installing this via the update.zip method (renaming the ROM to “update.zip” and putting it at the root of my SD card). I ended up purchasing ROM Manager (which includes a recovery manager allowing you to backup and restore your entire device, plus it allows you to easily download and install new ROMs). SPRecovery is a free recovery manager, but with the extra features that ROM Manager had (mainly the ability to install Pete’s BB v1.1 in a method differently to the update.zip routine), I felt it was worth the $4 price. To fully unlock the potential of your Android device, you need to “root” your phone (which is the same concept, essentially, to jailbreaking an iPhone). To root my Droid, which came with the 2.1 firmware, and as of now, is not able to be rooted, I downgraded to 2.0.1 using the RSD Lite – spf downgrade method (search Google for it). Then, I installed DroidMod Updater, which rooted my Droid and installed the DroidMod ROM. I then installed ROM Manager, backed up the phone, then installed BB v1.1 and the baseband upgrade (which is for the cellular radio of the phone). I’ve installed a bunch of different ROMs on my phone the past few days, but that is mainly due to learning about the different aspects of the device and the Android platform. So far I’m happy with Pete’s Bugless Beast v1.1. If you’re thinking about getting a Droid, I’d highly recommend it!